Is your printer out of warranty? Our skilled technicians are trained to work on more than ASP (Authorized Service Provider) products. 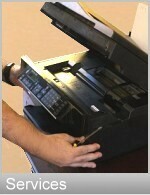 Please call our technical support line to see if we provide service for your printer model. Becoming a Registered Service Customer is free, fast and easy, and allows you to keep track of all your printer service requests. You don't have to wonder when a request was made, when you received a response, or how long the service will take. We will always keep you updated. This is particularly helpful for large companies and organizations with multiple printers that need servicing. Once you become one of our Registered Service Customers, you can simply log in on the Login page of this website and immediately see a list of all your past service requests, if you have any. Then, if you need new service on a printer, you simply click on the "Add a New Job" link and fill out our Printer Jobs Form (example). Your request will be immediately sent to us and we will contact you as soon as possible about getting your printer serviced. As an added service, we can also customize your Printer Jobs Form, so it can be made to fit your company needs. Contact us about becoming a Registered Service Customer today! Registration is free, but subject to approval. Call 952-226-5900 (in the Twin Cities) or 1-877-839-5901 (toll free) for Service or to become one of our Registered Service Customers.